We slept under a mosquito net for the first time last night – quite pleasant, not claustrophobic and we haven’t developed any symptoms of mosquito-borne diseases yet. 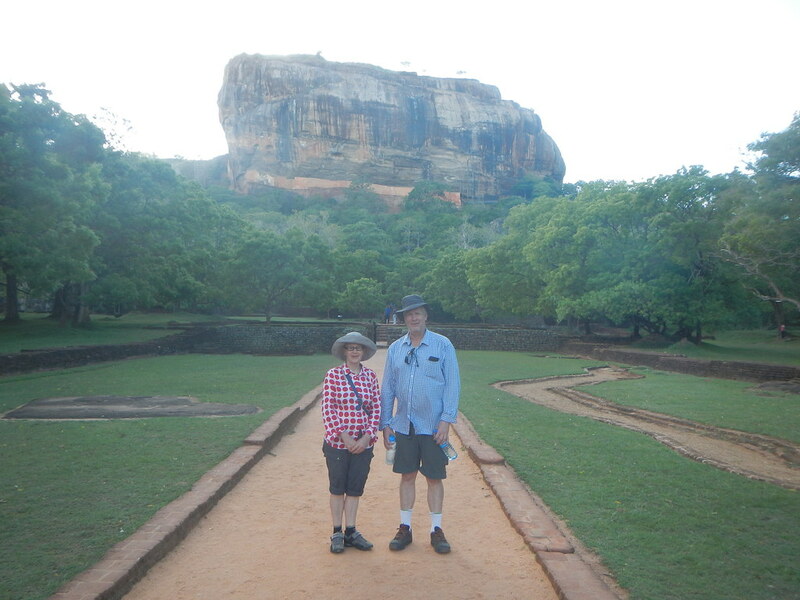 We were up bright and early and spun our way unladen and unbreakfasted to Sigiriya to climb the rock. We met our guide Samantha (a man) as arranged after a chance meeting last night and waited for the park to open at 7am. We had splendid views but it would be great to be on top with the sun even lower in the sky. Sigiriya (lion’s throat according to Samantha) is a large and ancient archaeological site with moats, water gardens, cave palace, etc built by King Kasyapa in about 450 CE. The eponymous, giant lion’s head entrance half way up has long-since crumbled away but two beautifully-carved feet remain on either side of the grand staircase. King K seemed to lead a lusty high life with his wife, 500 concubines, saucy frescoes, dance halls and enough slaves to keep the water flowing and the place swinging. As you might expect, in true Shakespearean/Mahabharata tradition, the story doesn’t end well but it was fun (for a few) while it lasted. We climbed countless steps, saw many cave-palace ruins, vertiginous stairs and some soft-core frescoes beautifully and finely-drawn. Breast fetishism was clearly all the rage and either the artists were guilty of wishful thinking or the advanced technology of the era stretched to breast implants. The scale and engineering of Sigiriya may not have rivalled Anuradhapura but they are nevertheless astounding. Clearly, Sri Lanka was a fabulously wealthy country in those times. Our plans for breakfast were curtailed by a local power outage that lasted all day. We enjoyed a shady siesta before taking a tuk tuk to Dambulla where we enjoyed a sumptuous lunch in a swank restaurant that wasn’t as good or cheap as in Anuradhapura but still tasty and good value. 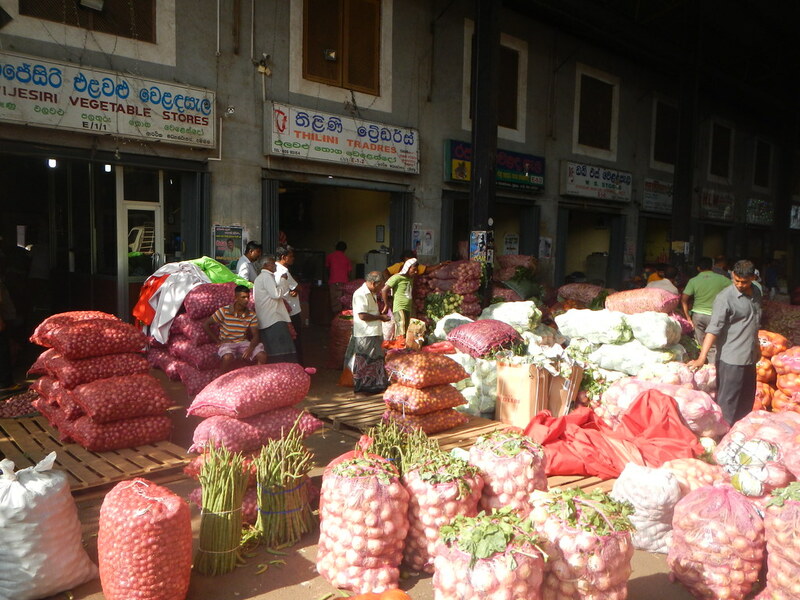 Dambulla seemed busy for a Sunday and the huge wholesale fruit and vegetable market was absolutely rocking – jam-packed with delivery trucks and dealers moving thousands of tons of fresh produce in the sweltering heat. 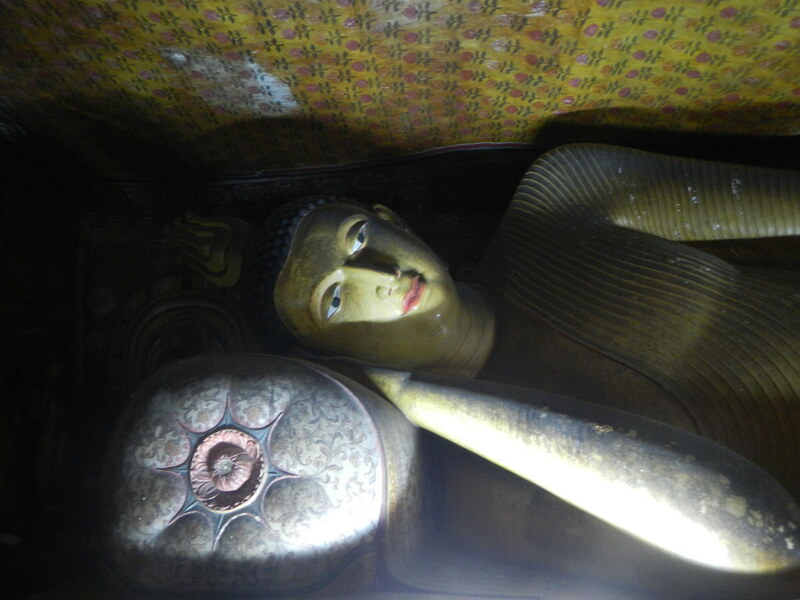 After the earthiness of Sigyria we also enjoyed the sacred Buddhist Cave Temples of Dambulla. More steps to climb but hundreds of Buddhas, frescoes, the works. 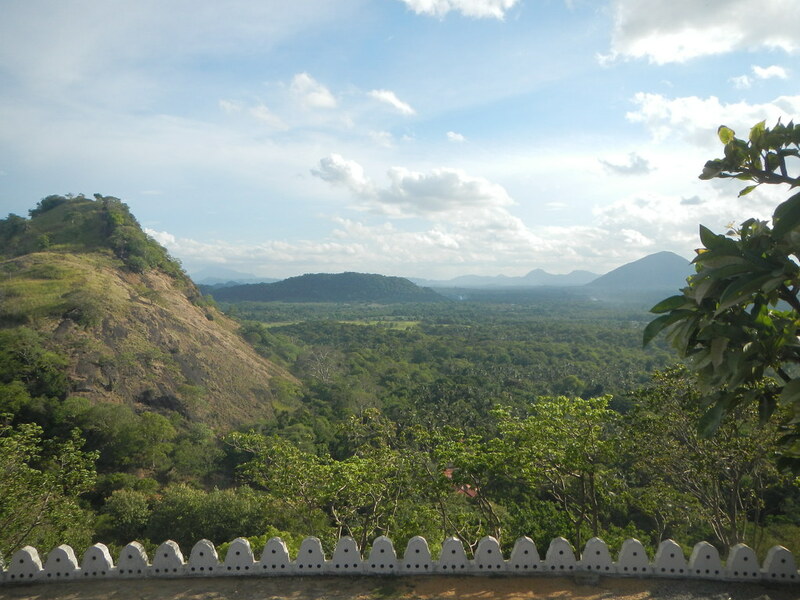 As on the top of Sigiriya, there were beautiful views and breezes. At ground level Sri Lanka is beautiful but from a high vantage point, especially in Dambulla, it looks like a fabled land – a botanical garden stretching as far as the eye can see and fantastical valleys stretching to distant mountain peaks through the slight tropical haze. The views scarcely seem real. Back to our digs. The power is back on now. Pay up. Pack up. Get ready for an early start for Matale tomorrow. This entry was posted on 13 September 2015 at 3:04 pm and is filed under Sri Lanka. You can follow any responses to this entry through the RSS 2.0 feed. You can leave a response, or trackback from your own site. We are now in the highlands, above mosquito level!